We paid DP and locked our date for a wedding that's still 1 and a half year away, due to family problems, the groom's family demanded for the wedding planning to be put on pending. 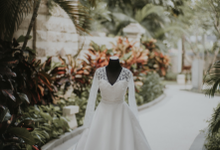 We communicated this with the vendor pretty clearly, and they said they understand, and then we ask to be informed first if they want to consider letting go our locked date for another client. Until it was a year away from our wedding, and we've resolved to go forward with the wedding without the groom family at all. Then we ask them for ONE meet up between them and the bride's parents before paying (which we're very prepared to do without any delay. since delay was never part of our/the bride's family plan. plus this time we ditched the delaying party already ), but turns out they had decided to take another client on that date and said that they can't work with us due to the planning delay that happened, and the DP is now invalid. In my opinion, they really should've told us first before making that decision. We would've not minded finalising contract or proceeding with another payment before the deadline had they informed us of a deadline. 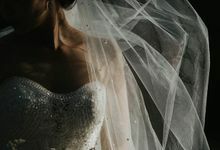 ---more on the detail--- When our wedding planning started to get back working again after our "hiatus", we reached out to them with questions and discussions. We were still getting replies and the talk was really going towards making it happen, none of them told us straight that "the delay was too long so we can't take your project" or "you gotta pay now if we want to proceed or else we'll take another client instead". So then the talk went on for 1-2 days until we asked for a meet up when suddenly, we got a respond saying that our delay from last year was too long, and they've already dropped this for another client. Honestly, it would've been better had they told us straight of a deadline before we come back restarting the event talk, or even just right when we started talking about it again. Instead of leading on and keep talking about it only to shot us down in the middle of it. We fully recognise that ours was kind of a "special case" of sorts, and a delay of 5-6months might not be tolerable, however, we would've appreciate getting informed of that /beforehand/. We sincerely hope that they won't have to deal with yet another future client that need some delays in the middle of their planning, but in the case that they do, our feedback to them would be to give a clear strict deadline, and lay it out frankly from the get go. Hi Natasha, apologies for your disappointment. 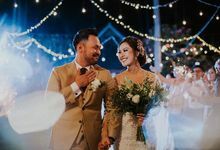 We were surely very excited to decorate your wedding since our agreement in Bridestory Market - July 2018. You have paid IDR1.000.000 (1 million rupiah) booking fee and agreed to pay the Deposit for the decor by end of July 2018. It is now January 2019, and you have not fulfilled your part of the agreement. We have informed you and Felix several times that the agreement was to pay the deposit by end of July 2018 or we have the right to take other clients and booking fee is non refundable. The reasons for you pending the payment differs from what Felix told us, kindly see our chat with Felix where we have informed him of another potential client on the same date prior to us starting the discussion on the wedding again. We have a company to run, employees to pay, operational costs to bear and we cannot refuse another client who was willing to deposit and keep their end of the promise over another client who has been informed several times on the course of 6 months to pay their agreed deposit since end of July 2018, but have not. 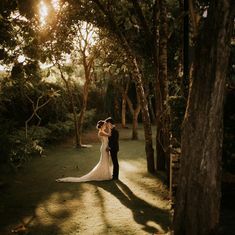 We apologize if we could not take your wedding, since you broke the agreement and it is a fair and normal practice in all businesses that if agreements are not fulfilled, we have the right to drop the client. Thank you and good luck for your wedding. We first met Jess and Jenn at Bride Story Market. I was attracted by a pretty table set up in the booth that made me stop by to admire the beautiful table decor A month later I contacted Jess through WA. What surprised me the most when she told me that we have met before in BSM, our wedding venue is Ritz Carlton Bali. Omaigattt.. What a good memory. I believe she met lots of couple during the expo. How can she remember clearly. From that moment I am sure I have found the right wedding planner who will remember all the detail very well. Not only assigning Amara as our wedding planner but also for the decoration. Jess has an awesome taste and very good eyes. The bridal table was so dreamy, exactly like what I have always wanted #lovestruck. I could not believe the table set up that I fell in love with in BSM was recreated in our wedding day. Super super love your work, Jess. Jess and Jenn were very responsive whenever I asked them questions. Jenn is a very detail-oriented person, she will never miss a thing. I know I can fully trust her on the wedding day with no worry. Thank you for assigning Winda, a very thoughtful bride assistant. I couldn’t ask for anyone better. We can’t thank you enough for organizing our most important moment in life. 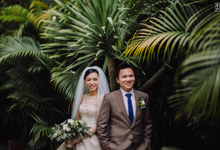 All the little and big things you did to ensure our wedding day went smoothly. It would not have been possible without your help. We were extremely satisfied with the entire wedding vendors. If we could do it again, we would still choose you. If they are not worried, you shouldn’t be! 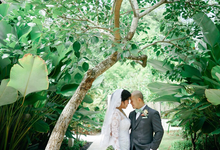 Amara Universe is the perfect wedding planner and organiser for our dream wedding! 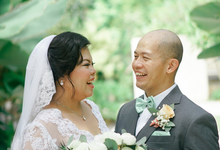 We have sooo much to thank the whole team for and we are so glad that we went with our instinct and chose Amara since the beginning of our wedding journey. 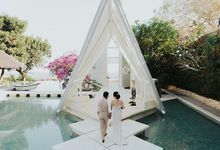 At the 2017 Bridestory Market, we were looking for a Bali-based wedding planner and organizer and chanced upon Amara Universe. Our meeting was brief but detailed, but we kind of already knew that Amara Universe was the one for us. So we chose Amara Universe for our wedding and it was the best decision ever. We started planning 10 months before our wedding day but we only met the team face-to-face 6 months in. Communication with the team via WhatsApp was very efficient - Jenn and Jesse were always very responsive, even replying at 2-3am! Whenever we had questions or vendors that we wanted to check out, the team would help us check immediately and this definitely made the planning process for us soooo easy and convenient. Amara Universe was also on point with the timeline that we were able to settle most of the important stuff way before the wedding day - this was super crucial and helped us lessen our stress before the wedding. We are very glad that Amara was very transparent and fair regarding vendors, always giving us the best options and telling us the pros and cons of each of them, without pressuring us to choose a specific vendor. They also communicated with all our vendors, which was again very convenient and made everything less complicated for us. This also definitely ensured that everything went smoothly as planned on our wedding day. 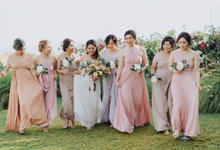 On the day itself, each of us (bride, groom, parents, bridesmaids, groomsmen) were provided our own assistants. Coordination and communication between the whole team was very efficient. We also noticed that each member had very good knowledge about the event and vendors involved. We were surprised that the team stayed behind until our after party was over (2 am) to ensure that everyone got back safely. We were very thankful to Andris who heated up the party and encouraged everyone to get on the dance floor. Jenn and Jesse kept in touch with us throughout the next few days (and even until now). We stayed in Bali a few days after the wedding day when, unfortunately, the volcano erupted the day before our flight back home. Thankfully, Jesse has good connections with many hotels and helped us make arrangements for free accommodation at our hotel (Alila Seminyak) just in case our flight was cancelled. All in all, Amara exceeded our expectations. Our wedding really was the best day of our lives. Many of our guests and family members still rave about how amazing the night was. We dreamt of a perfect wedding and Amara made it happen. THANK YOU AMARA TEAM!! If we could rate higher than 5 we definitely would! We are open to any religions. 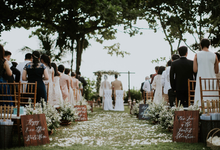 However, for legal and religion wedding to be acknowledged by the civil registration, we must abide by the rules of the Indonesian government. We require a minimum booking period of 6 months prior for Full Service Planning and 2 months for On The Day Management. To secure the date with us, we require you to sign our event agreement prior invoicing. Then, once 50% down payment is received, our services on your wedding date will be secured. Our working hour for one day wedding is up to 12 hours. 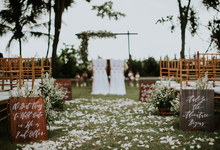 Is Legal and Religion wedding included in your handling fee? How many persons in the team on the day? Depending on the complexity of the event but we start from 9 - 12 persons for 300 guests. 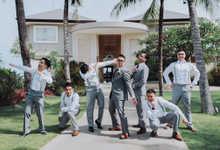 Do you do wedding outside Bali? Our attention to details, experience, proactive attitude and professional service have been the key for our line up of successful events. Can you help us with airport pick up, welcome dinner, after party and other wedding related arrangements? Do you help us with the vendors? Yes, we prefer that we provide the vendors for you as our vendors have gone through a selection process through out the time. Our vendors selection criteria are based on: Pricing, Product Quality, Professionalism and Honesty. If you bring your own vendors, they must understand our working terms and conditions in the contract. Our first step is to Converse with you, get to know what your preferences are, your love story and your vision. 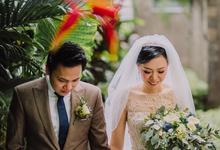 We take the time to listen and style a personalised wedding based on you. 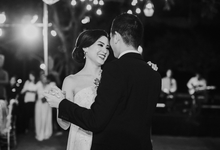 Each and every client that have came to us, have become a part of our live and we share your happiest moments by creating something so incredibly beautiful. 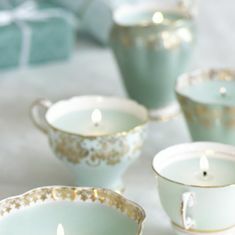 No detail is too small to be overlooked, no requests too demanding to be heard, no wedding too small or big to plan. We walk with you throughout your planning of the big day. 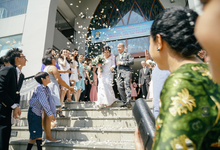 Our business started in 2012 and have since become one of the most well know wedding planners in Bali. Your out of the box wedding planner that craves for everything custom and personalised. From On The Day Management service, to Full Planning and even A Lifetime Journey service which includes the planning of your honeymoon. We are there to listen, style, plan and manage the big day.